Recently many Rawafid (mostly converts) started to deny the bitter fact that Ali (RA) did indeed marry HIS and FATIMAS (RA) daughter Ummu Kulthum to Omar (RA). They come up with weird explanation to twist the truth. But who is a bigger Hujjah/proof on them than one of their biggest Marjas/Ayatollahs of the last century? Ayatollah Khoie says: Yes, according to the traditions and our narrations Ali (RA) gave his DAUGHTER to Omar (RA). The story of the assault on Fatima (RA), the burning of her house, and the murder of her fetus is not supported by a prophetic narration or by an authentic historical story. Logic and common sense rejects this story at all costs. Most of the sources Raafidha are mentioned are either absolutely unknown, or contain lots of unauthentic reports. Get used to the fact that a report doesn’t become authentic just because some historian wrote it! Let us assume for the moment that Abu Bakr and Omar bin Al-khattab really committed that heinous crime. But what about Ali bin Abi Talib? How could Ali stay quiet while his wife is beaten, his house is assaulted, and his son is killed? Is this the portrait of Ali bin Abi Talib that the Shia are trying to paint? The least man in faith, chivalry, and manhood will not allow his wife to be beaten. Then how come when the woman is the daughter of the Prophet peace be upon him and the man is the mighty Ali bin Abi Talib? This is the result of the fabrication in history that became one of the tenets of faith for the Shia. Ayatollah Al-Sayyed Hussain FadlAllah, the grand Shia scholar in Lebanon, stated clearly that he does not approve this accident to be true, he heavely doubts the assault on Fatima. Hence, lots of Shia scholars waged a war on him. They charged him with “Wahhabisim”. One of the grand Shia scholars in Iran Al-Tabrizi had issued a verdict excommunicating FadlAllah from Shiasim because FadlAllah had doubted (till his very death) one of the major religious beliefs of the Shia. 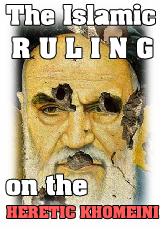 FadlAllah’s doubts had come after extensive research in the Shia’s version of the story of the assault and he depended much on logic and common sense. So not Only Muslims/Sunnah reject this fairy tale but even logical thinking Shias themselves!